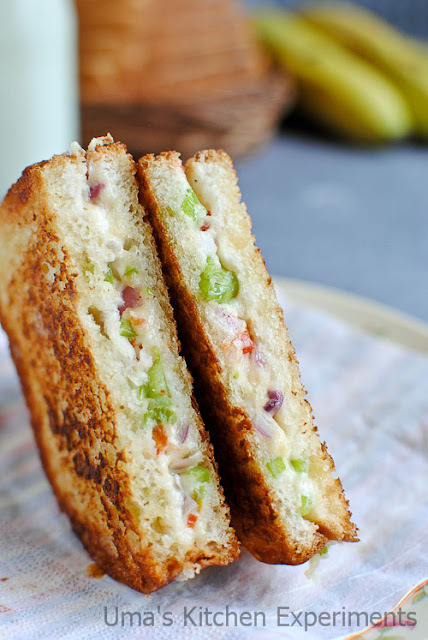 Just realized that I have not posted any sandwich recipes recently in my blog. 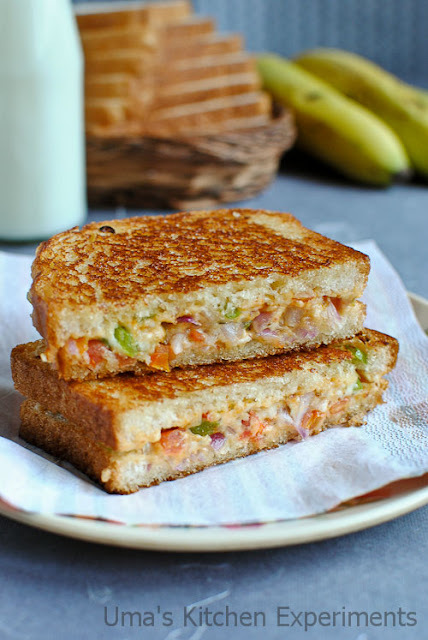 I make sandwiches often at home with different stuffing but never got time to click pictures as I prepare sandwiches only when I ran out of time and other ingredients. 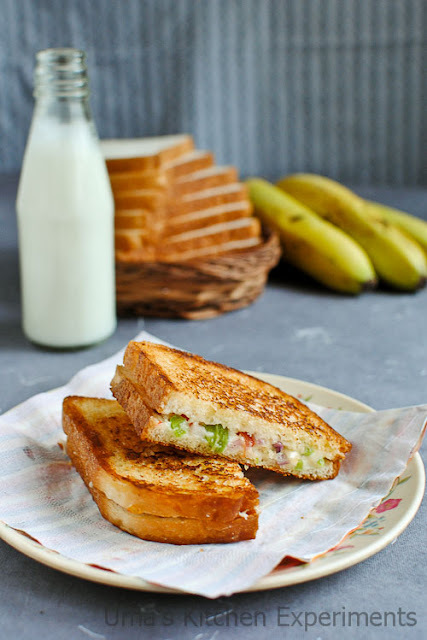 Two days before, I prepared cheese sandwich for my family members and quickly clicked the last sandwich which I enjoyed. They were very crispy, buttery golden crust sandwich with ooey gooey cheese stuffing. I added very less cheese for my bread slices alone which is shown here(I am sometimes calorie conscious. :-)). Add more cheese, for extra cheesy and tasty sandwiches. 1) Mix grated cheese, onion, tomato and capsicum in a medium size bowl. 2) Add salt, red chilli powder and oregano. Mix well. Keep it aside. 3) Take the bread slices and apply butter coating only one side of each bread slices. 4) Heat a tawa or pan over low heat. 5) Place a slice of bread in the pan with buttered side down. 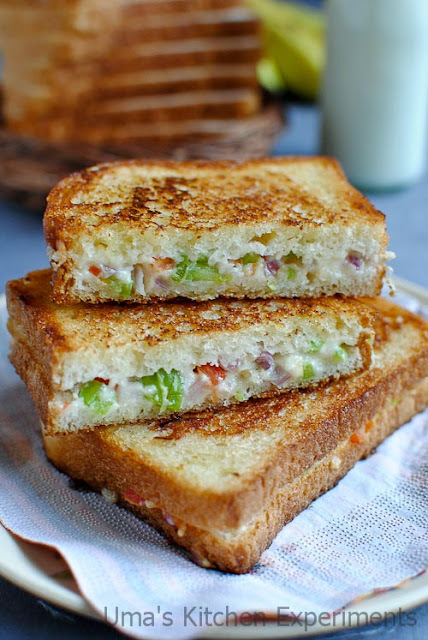 Spread a tablespoon of cheese mix evenly on top the bread quickly. Feel free to spread more cheese mixture if you love cheese. 6) Place another bread with buttered side up on top of the cheese mix. 7) Using a ladle, slightly press the sandwich down. 8) Turn the bread to other side carefully and cook until golden brown and crispy. 9) Flip again and cook the other side till it gets brown and crispy. 10) Cut into two and serve hot. 1) Increase or decrease the cheese stuffing as per personal preference. Add more cheese for extra cheesy sandwich. So...this week is "Bread week"??! :) sandwich looks colorful n appealing! 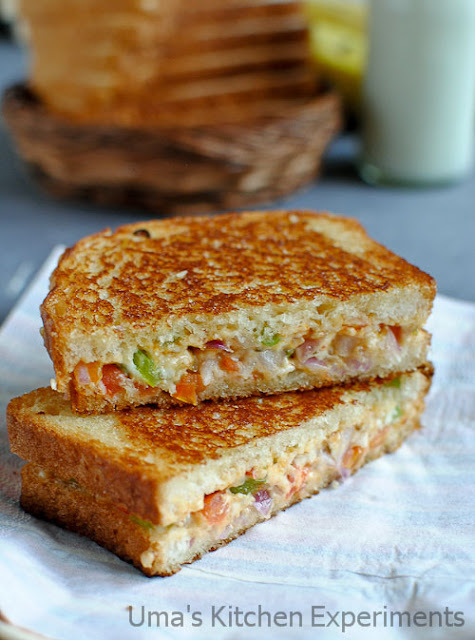 looks cheesy and yummm..nice clicks..
wow delicious sandwich,sure kids love it...loved ur clicks Uma. Omg, wish i get this sandwich rite now,i'll happily have it anytime. can we make these with wheat bread?? ?